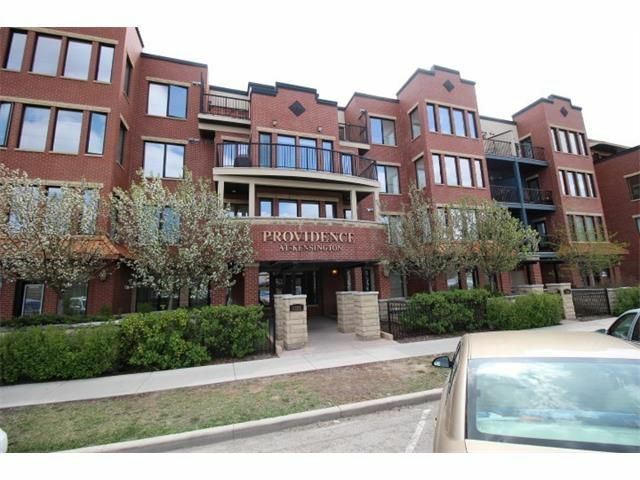 This gorgeous 2 bdrm, 2 bath condo in the highly sought after "Providence Kensington" building, is located steps away from all the shops and restaurants of "Trendy" Kensington and only a few minutes walk to the DT core, Bow River and Parks. This immaculate condo is perfect for entertaining with upgraded stainless steel appliances, granite countertops, Santos mahogany flooring thru-out with in-floor heating, rich dark cabinets and a large balcony which looks North over a park. The master bedroom is very spacious with a walk-thru closet leading to a 4 piece ensuite. The 2nd bedroom is on the other side of the unit offering great room separation. A large living room, separate dining area and a 4 piece bathroom complete this barely lived in corporate condo. In-suite laundry, air conditioning, all furniture, dishes, pictures are included in the sale plus one titled underground parking stall, a storage locker and fitness room.